We regularly add our Digital Collections and library catalog item records to Summon. The "Add results beyond your library's collection" checkbox expands your search even further. 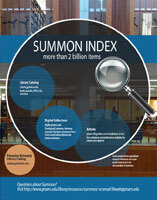 The massive Summon Index contains billions of item records. Looking for demonstrations of Summon's features in action? Visit the Podcasts page. If you are having difficulty finding a particular book in Summon, please try looking it up in the library catalog: https://catalog.ptsem.edu. There are still reasons to search the library catalog* directly. According to the vendor, ProQuest, Summon is a starting point for research; it doesn’t replace the online library catalog when it comes to content originally indexed there. *What is a library catalog? Summon includes many, many resources, but not everything to which Princeton Theological Seminary Library subscribes. ** Use the Databases (A-Z) list to locate and search within a specific database. Also, Princeton University has its own complex library search engine – available at https://library.princeton.edu. Search there or directly in the Princeton University library catalog (https://catalog.princeton.edu) for materials in Firestone Library. Too many results? Vague or short searches will return too many results; searches using well-refined search terms or phrases in quotes will return fewer, more refined results. To conduct a more specific search – such as for a particular book or article – use the Advanced Search options. **Why aren’t all available resources included in Summon? Some publishers/vendors choose not to allow ProQuest (the maker of Summon) to index their content whether for technological or other reasons. Citation Trails: Explore a topic and collect material by following a chain of articles that cite each other. Search results now (often) include cites/cited by articles. Language drop down menu for selecting user interface language now displays options in the native language. Results numbered to help you keep track of where you are in the results set. Accessibility: Labels have been added to the search landing page and main page search boxes, and the date picker has been upgraded. More of our online journal subscriptions are now connected to Summon making more full text more easily discoverable. Broken links/dead ends: Occasionally, the path between an item in the search results list and the citation or full text doesn’t work properly. If this happens, please let us know – either by using the "Report a problem" link within Summon or by emailing libweb [at] ptsem [dot] edu. Tell us what you were looking for and what happened; please be as detailed and specific as possible. Thank you! The real time availability display in search results seems to be lost from time to time. Most books in the library catalog do circulate. Click the "Check Availability" link in the search result to view the full details. We are not able to add any more options to the Refine Your Search feature at this time. The pages of the library website (https://library.ptsem.edu/) are not able to be indexed (unfortunately). Select pages are being included as "Best Bets," a feature similar to the Database Recommendations you may have seen in Summon. Want to embed a Summon Search widget or search box on your own website? Visit https://ptsem.summon.serialssolutions.com/widgets and click on Search Widget or Search Box Builder to get started. Used under a Creative Commons Attribution 4.0 International License from Virginia Tech Libraries.